Lynn Laidig and Marty Jewell celebrate Mardi Gras in Olde Town Arvada March 5. Brothers of Brass band led a Fat Tuesday parade in Olde Town March 5. Patty Gleich, of Arvada, dances to the tunes of Brothers of Brass during the Fat Tuesday parade in Olde Town Arvada. Joseph Hengstler, executive director of the Arvada Business Improvement District, leads the brass band into Denver Beer Co. to end the Fat Tuesday parade. Khalil Simon plays tuba with the Brothers of Brass band while walking the streets of Olde Town Arvada. Maro Dimmer and staff at Rheinlander Bakery came out to feel the music during the Fat Tuesday Parade. Ethan Harris plays trombone with Brothers of Brass during the Fat Tuesday kickoff parade in Olde Town Arvada. Brothers of Brass led community members along the streets of Olde Town for a Fat Tuesday parade. The Arvada Center for the Arts and Humanities continues the third season of its Black Box Repertory on March 15 with the world premiere of “Sin Street Social Club,” a comedic adaptation about women discovering their destinies on the swinging streets of 1916 New Orleans. In this play, described by the Arvada Center as a "flirty, fun, feminist comedy," Helen, a novice nun, and Florie Mae, her nightclub singing sister, take to the streets of 1916 New Orleans during Mardi Gras in a last-ditch effort to save their departed daddy's dance club. Performances take place Wednesdays at 1 p.m., Thursday through Saturday at 7:30 p.m., Sunday at 2 p.m., and select Saturday matinées at 2 p.m., through May 19. For tickets, and additional details, visit www.arvadacenter.org/sin-street-social-club or call the box office at 720-898-7200. The Brothers of Brass band brought the party to the streets of Olde Town Arvada March 5 during a Fat Tuesday kickoff parade. The first of its kind event in Arvada was a partnership with the Arvada Center for Arts and Humanities, the Arvada Business Improvement District and the Arvada Visitors Center. 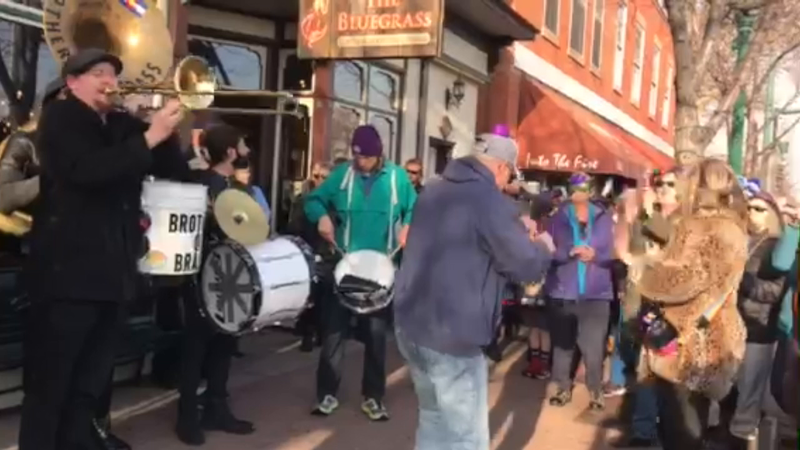 The parade kicked off in front of The Bluegrass Coffee and Bourbon Lounge on Grandview Avenue with music from the Brothers of Brass, a local brass band. With community members following, the band continues down Olde Wadsworth Boulevard stopping to jam at several spots before they landing at Denver Beer Co. for a grand finale. Many businesses in Olde Town joined the celebration by offering Mardi Gras themes dishes and drinks.